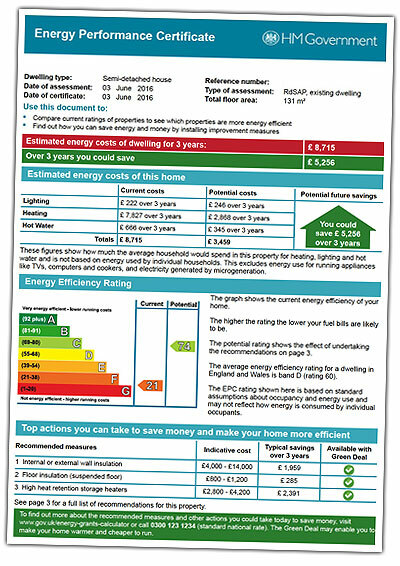 If you are about to sell your home or rent out a residential property you are required, since 2008, to have an Energy Performance Certificate (EPC). Not having one is unlawful and could be subject to non-compliance penalties. If an EPC is not made available to any prospective buyer or tenant, the owner or landlord may be fined between £200 – £500. Before you instruct us we recommend you check the EPC Register to ensure you do not have a valid EPC already. Remember, they last for 10 years. An EPC is an assessment of how energy efficient your property is conducted by a qualified and accredited Domestic Energy Assessor (DEA). The role of a Domestic Energy Assessor is to determine how the space is heated and how easily that heat can escape. The assessment will look at your walls, flooring, heating system, lighting and loft to begin with. Photographic evidence would need to be taken to justify any decisions made and floor plans would be drawn. Typically, an assessment should take no more than an hour. A fixed price regardless of type of property. Secured online payment to save time. Send us a text with “EPC” and “YOUR POST CODE”. We will reply to confirm our availability. The simplest and easiest way is to book online. Remember to provide the address. Our specialty is to improve the energy efficiency of homes throughout the UK. We do this by implementing the recommendations found within your EPC. We can access grants and funding to help you. These grants are available to everyone. Simply complete the details below and find out for yourself.